When it comes to skincare I’ll pretty much try anything once, within reason. Lately my skin has been causing me to slightly panic as its once blemish free complexion has begun to house some unsightly, unwanted visitors. My chin especially has been receiving the brunt of this invasion and it has prompted me to call in the big guns. 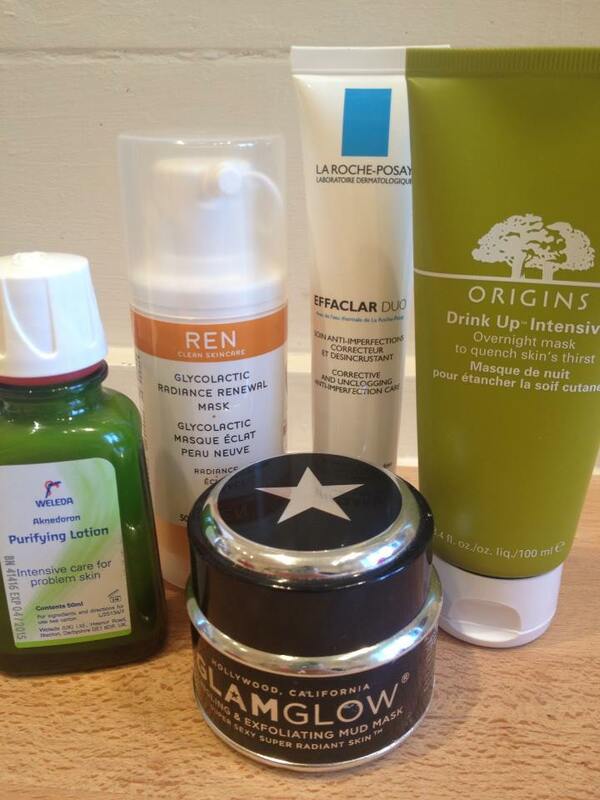 So here they are, a rundown of my go to skin treats to help in the fight of ridding my complexion of the ugly side of beauty. Weleda Purifying Lotion. This is brought into action when my skin is uncontrollable. Admittedly this is very rare but on the odd occasion when I feel it necessary to be dramatic in the wake of a facial eruption this all natural Australian remedy brings it. With a soothing combination of calendula and chamomile to sooth inflamed areas and zit-busting witch hazel, I’m glad I have this in my arsenal in the fight against blemishes. Plus if it’s good enough for models then heck, it’s good enough for little old me…. La Roche-Posay Effaclar Duo. At first I was a little sceptical to try this. It seems that if something enjoys a hype on the beauty blogger circuit it still doesn’t guarantee that the product’s going to work. I bought this when desperate times called for desperate measures and my congested and down right spotty skin needed sorting out. I’m not going to lie, this stuff takes about a week to work but my goodness does it do wonders. I’m happily sat on the back of the bandwagon for this one and my sebum blocked pores are quaking in their boots. REN Glycolactic Radiance Renewal Mask. This one is new to my skin care neighbourhood but after needing that perfect mix of exfoliation and radiance boost this little number is quick on its way to becoming my favourite mask. That’s quite the statement considering my shameless stash of them. The texture is a little bit tricky to get used to but once you’re over that hurdle you’re on to a skin care winner. The glycolactic acid exfoliates the dead skin from your face and as I’m the guilty owner of a dehydrated skin this stuff has been a godsend. GLAMGLOW. Hailed as Hollywood’s best kept secret it would appear to be one of those cliché marketing strategies that has you reaching into the bottom of your purse. It’s far from it. It’s a clever mix of volcanic rock, sea clay and green tea that strangely tingles but magically draws out all of the congestion from your pores. The end result? Sparking skin without a blackhead in sight. Sold! Honestly, I use this once a week to draw out all of the rubbish my skin has held onto through oil cleansers and balms (seriously, how does it get past those?!) What’s even better? You can actually see the contents of your blocked pores come to the surface. I’m now massively conscious of how weird that makes me sound but it’s pretty rewarding to see it has worked. Origins Drink Up Intensive. This Origins miracle worker comes to force when my skin is super dry. seriously, at times my skin can resemble the Sahara desert and belive me, it’s not a pretty sight. For once I can’t blame the cold weather so to avoid making excuses I use this as a night-time mask to give a much-needed moisture boost. I’m not usually into highly scented skincare but I have to say that the smell of this one is incredible. My skin laps this up and it does exactly what it says on tin; drinks it up. Goodbye dull and drab – Hello healthy and hydrated! What do you use when your skin needs a little bit of TLC?